OMEGA’s SSRINT660 Series “Intelligent” Solid State Relays are fully integrated with heat sink and DIN rail mounting plate in a space-saving design. 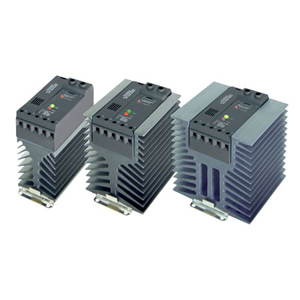 They are touch-safe with LED input indication. All units come with built-in, replaceable semiconductor fuses. LED’s indicate fuse failure. These “intelligent” relays automatically shut down when in over-temperature conditions. When returned to normal operating temperatures, the relay will turn back on. “Intelligent” relays are single pole, normally open devices, capable of millions of cycles of operation. Dual SCR’s provide a high level of reliability. Switching takes place at the zero voltage crossover point of the alternating current cycle. Because of this, no appreciable electrical noise is generated, making SSR’s ideal for environments where there are apparatuses susceptible to RFI. Although these relays have integrated heat sinks, SSR’s should be located where the ambient temperature is relatively low, since the current switching rating is lowered as the temperature increases (see derating curves). Another SSR characteristic is a small leakage of current across the output when the relay is open. Because of this, a voltage will always exist on the load side of the device.